I'm in a bad mood because I had to switch my dress alteration appointment so that I wouldn't have to miss work but the only other time they can do it requires me to take off work anyway. Why does everyone get married in the summer to the point where they are completely booked for all of July and August!? Okay. Breath. Not the end of the world. Back to a happy wedding place! While realistically I'm going to go to Home Depot and buy a can of pre-made paint, if I have a lot of time I might just try this home-made version. First off, you'll need to get your hands on the following supplies: 1/2 cup acrylic paint (choose any color you like, or mix colors together to make the perfect shade! ), 1 tablespoon unsanded grout (this can be purchased at most hardware/home improvement stores), mixing cup or bowl, spoon, paint brush and an object or board you plan to paint on. Step 1: Measure out your paint and grout. The unsanded grout is a fine powder so be sure to work in a well ventilated area. Step 2: Stir the grout into the paint until no lumps remain. 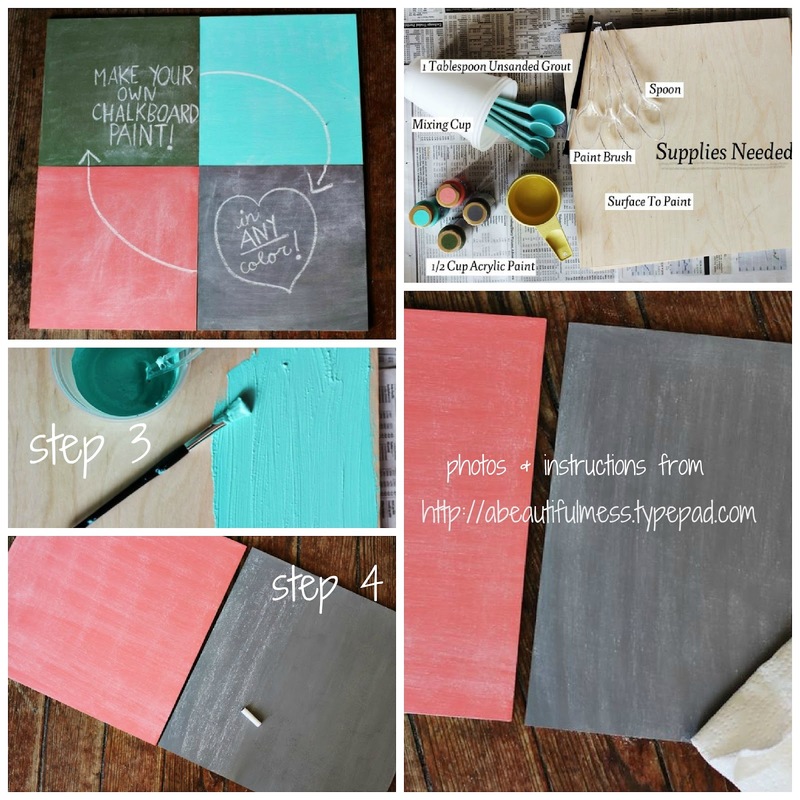 Step 3: Paint your surface with your new custom chalkboard paint! The paint will begin to harden once it is mixed, so only mix what you need at one time as it won't store as well as other paints. Step 4: Once your chalkboard has fully dried be sure to slate the surface before using it for the first time. To slate a chalkboard lightly rub chalk along the surface and then lightly rub it off.